Belgium and Japan served up a World Cup classic on Monday night but it was Nacer Chadli’s injury-time goal that sent the former through to the quarter-finals. Japan took a two-goal lead in the second half as they struck twice in four minutes to leave Belgium stunned shortly after the half-time interval. However, to their credit, Roberto Martinez’s men launched a sensational comeback as goals from Jan Vertonghan and Marouane Fellaini drew them level. Both sides continued to attack and look for a winner which in turn created an incredible spectacle for the neutral, but it was Belgium who broke Japanese hearts with the last kick of the game. 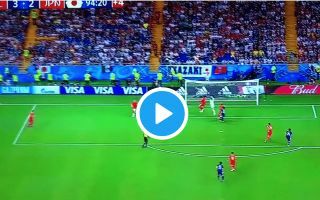 Just as Keisuke Honda saw his free-kick saved by Thibaut Courtois, Belgium launched a rapid counter-attack from the resulting corner led by Kevin de Bruyne. Via a brilliant step over from Romelu Lukaku to allow a cross to fall into Chadli’s path, he made no mistake as he swept the ball home to spark wild celebrations in the Belgium camp. In contrast, Japan were left devastated as after putting up such an impressive performance, they will now head home having failed to hold on to their lead with Belgium advancing to the quarter-finals where they’ve now set up a mouth-watering clash with Brazil. When you bag an injury-time winner to send your country to the #WorldCup quarter-finals ? @NChadli ?? ?